From the Pride Weekend Let's Get Busy Tonight show. Every two months, the folks at Let’s Get Busy Tonight put on one of the most fun hours of comedy that Dallas has to offer. 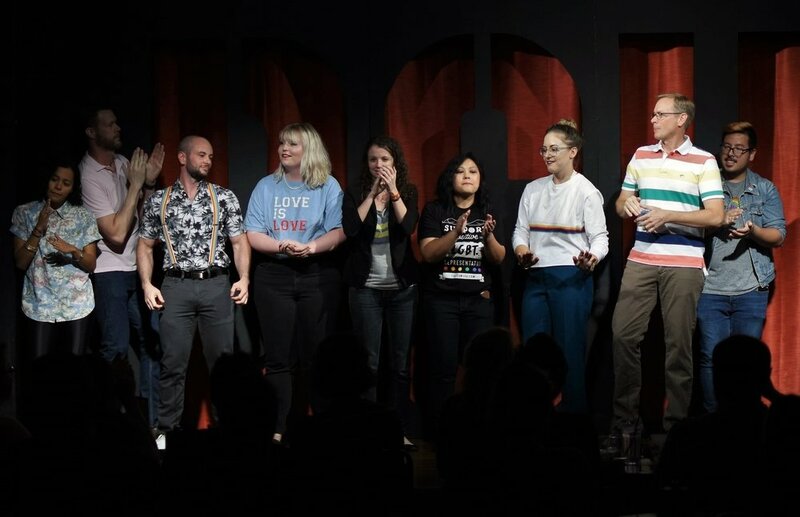 The cast is made up of veteran improvisers that combine their powers to create a variety show that is unlike anything else that the Dallas Comedy House has to offer. Each installment includes singing, audience interaction and a whole lot of pride. I chatted with Let’s Get Busy Tonight (Translation: I emailed them and then Scriven, who is very Type A, compiled all the answers) to find out more about this wonderful group of people and the show that they’re so passionate about. Enjoy! For those that aren’t aware, can you describe what Let’s Get Busy Tonight is? Raye Maddox- I like to think it's a very heterosexual, conservative, short-form show. But in reality, it's an hour-long variety show with an all LGBTQ+ cast. Scriven Bernard- The show is hosted by Miracle, who is me in drag (SURPRISE!). The first half is short-form improv, similar to what you see on Whose Line Is it Anyway? Then the second half is long-form, which is much like an improvised play. Corey Whaley- There are few opportunities for short-form, and it’s a great way to get more troupe mates and some audience members involved. With a long-form set as well, we may encourage those who were unfamiliar with improv to come back to see other shows. This show has been going on for about a year and a half, which is so cool! Do you have any favorite on stage moments? Darrin Larson- The first show. The audience was pumped and it felt like we were rock stars. When you’ve spent years trying to be who you aren’t, coming on stage with an all LGBTQ+ and feeling a packed house pulsating with energy and love for you is amazing. Divina Penaloza- Also, just finding a troupe that will accept me for all that I am and not judge me means a lot to me. Not that I didn’t get support from my other troupes, but this one, I feel I can try and be more vulnerable in. Jamie Zeske- Let’s Get Busy Tonight is special to me coming in relatively inexperienced. 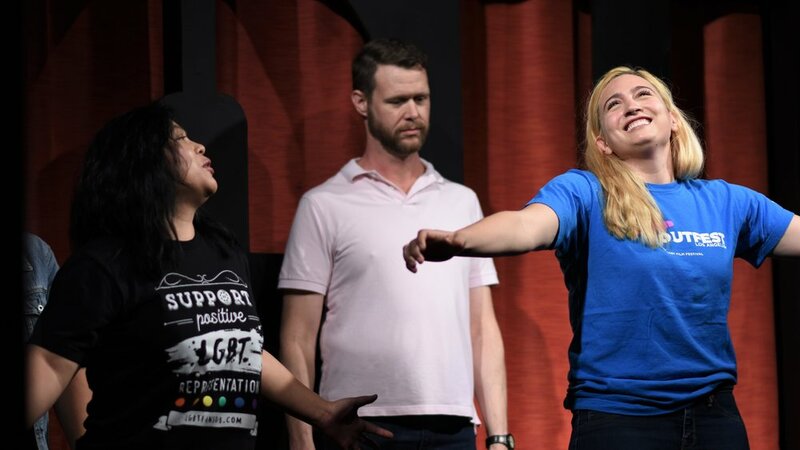 Knowing I would have an extra ounce of support and "yes and" from the audience and teammates helped build my confidence with other improv endeavors. Scriven- I second the support we feel in all the shows, but especially during the first show. I was kind of in a back-in-the-closet phase when the show started due to just general insecurities and whatnot, but the show inspired me to reevaluate it all and remember that I am who I am and can't help that. I felt safe in my skin again seeing how much people were willing to step in and be there for us. This hour of comedy is hosted by drag superstar Miracle. In three words, how would you describe her to someone that has never seen the show? Kirstie Carrizales- Courageous, faboogie, diva. Unlike many offerings at the theater, your show combines both short form and long form improvisation. As a performer, how is it to switch from one type to another? Kirstie- The switch is really fun, because I feel like the games are a chance for Miracle and the audience to mess with us. Then, the long form is a chance for us to really have fun with each other and it ends up feeling very rewarding. Raye- A true blessing. It allows us to play and harness an energy I have never found in a show that is just one or the other! It feels like you're a minecart of coal (diamonds? dynamite?) being pushed up a track and then, at some point, you climax over the top and carry all that momentum throughout the rest of the show. One of my favorite memories of the show came from the first night when the audience started singing along to each song that would conclude a scene. When you think of Let’s Get Busy Tonight, do you have a certain song that sticks out in your mind? Scriven- I think most of the playlists are done by Paco and me, and while we don't have a set show song, we play a lot by Britney, the Pussycat Dolls, Katy Perry, Rihanna, Queen Bey, the Spice Girls, J-Lo, Lady Gaga, Ke$ha. You know, all the gay anthems. If I had to pick one - I'd say "I'm Coming Out" by Diana Ross because 1) solid. song. 2) it represents what the show has meant for so many of us - the chance to showcase our pride in our identities and giving people the chance to stand up and have our backs. In the time that the show has been going on, you’ve had a few different themes like Beach Party, Valentine’s Day, etc. If you had an infinite budget, what would be your dream theme for Let’s Get Busy Tonight? Kirstie- Titanic, where we perform on A GIANT BOAT AND HAVE AN ICE LUGE. Raye- Fahrenheit 451. We'd all come dressed as our favorite books and then transition at some point into like...burning it off. It would be very risque. I'm mostly interested in the fire aspect of this. Can I change my answer to Fire? Paco: "Moulin Rouge." Make the whole thing cabaret themed and the entire stage has a giant heart sign made of lights. There is an LED screen in the background with themed backdrops for each game and Miracle is suspended from the ceiling on a shiny glitter swing. Kirstie: I change mine to that. David Allison is writer and performer at the Dallas Comedy House. He can currently be seen with Ballast Point, David & Terry and The Rift, as well as directing the sketch team Walker Dog and the improv team Watermelon. Previous credits include Jason: A Campy Musical, Freddy: A Devilish Musical, That 90s Show, Return Of The 90s, Sensation: The Next Great Play and more! Newer PostInterns of the Weeks: Josh Schneider and Andy King!